It’s decades later after this classic (and rare) political issue of PPTSS, and we’re still debating the same exact arguments. 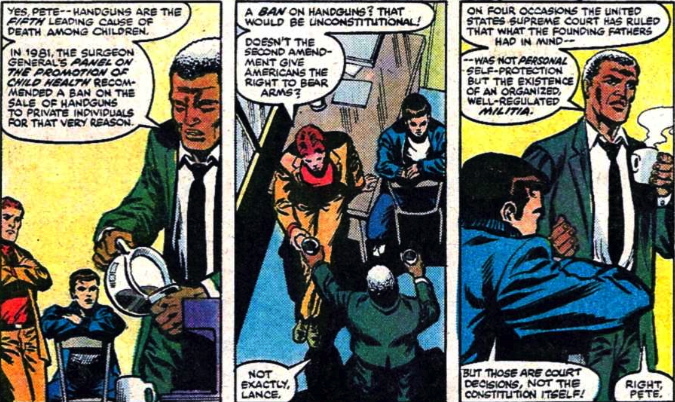 In a story titled, “With this gun … I thee kill!”, future public defender Bill Mantlo gives us a gun control story with Spidey having a bunch of adventures involving thieves with guns through the course of the issue. In one of the vignettes, we see a young boy watching his parents slain by a thief, under a streetlight, where the thief is holding a pearl necklace. I’m going to go ahead and call this a cross-over as a reference to the killing of Thomas and Martha Wayne in Batman #1. THE EVOLUTION OF MODOK PART 19: Red Hulk!